Since breakfast is the most important meal of the day, we might as well make it one that we really enjoy! For me, any food that has a Mexican flare excites me. In fact, my husband often says if he didn’t know any better he would think I’m part Mexican. 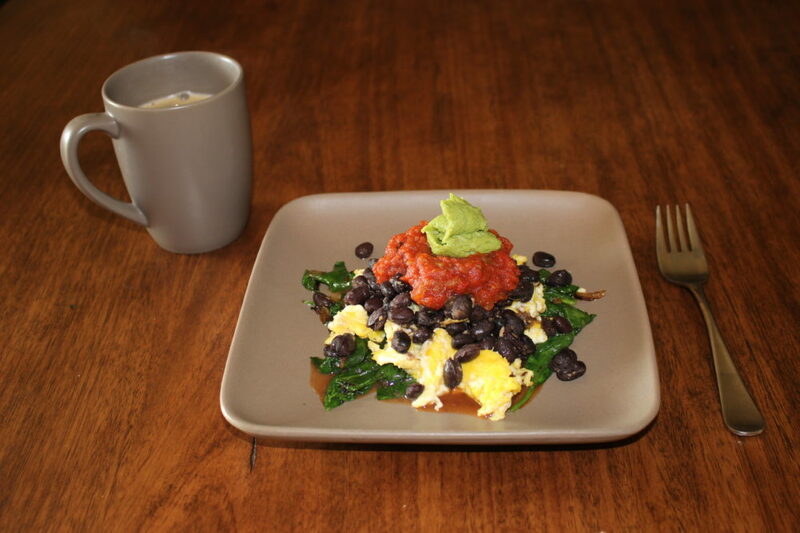 This Breakfast Burrito Bowl hits all of the bases including protein, healthy fat, and fiber. Also, there is something about the combination of salsa, beans, and avocado that just tickles me pink! In a saute pan on medium heat, add the oil and saute the onions and bell pepper until they are soft and browned, then throw in the spinach. Allow it to cook just until wilted. Remove it all and place in a small bowl that you will eat from. For scrambled eggs, crack your eggs in a separate small bowl and whisk together, then pour into the pan and stir until completely cooked. If you’d prefer to keep the yolk runny, separate the white and the yolk. Add the egg whites to the pan, stirring until they are completely cooked, then add the yolk near the end. When the yolk is cooked the way you like them, remove and layer in the bowl on top of your spinach. Add the black beans, jalapenos, cumin, chili powder, and salt to the pan, heating and stirring until the beans are warmed and the seasoning is well mixed into them then add to the layered spinach and eggs. Top your bowl with salsa and guacamole or avocado, then enjoy! If instead of eggs, you wanted to use cooked ground beef or sliced chicken for this recipe you certainly could. In fact, you can enjoy this meal any time of the day, not just in the morning. How do you enjoy your Breakfast Burrito Bowl? Do you have the calorie count for this breakfast burrito bowl? I don’t keep the calorie counts of my recipes. I think the focus should be on the quality of the food rather than the number of calories it contains.